This article originally appeared in the June 2017 issue of The Journal of the Delaware State Bar Association, a publication of the Delaware State Bar Association. Copyright © Delaware State Bar Association 2017. All rights reserved. Reprinted with permission. 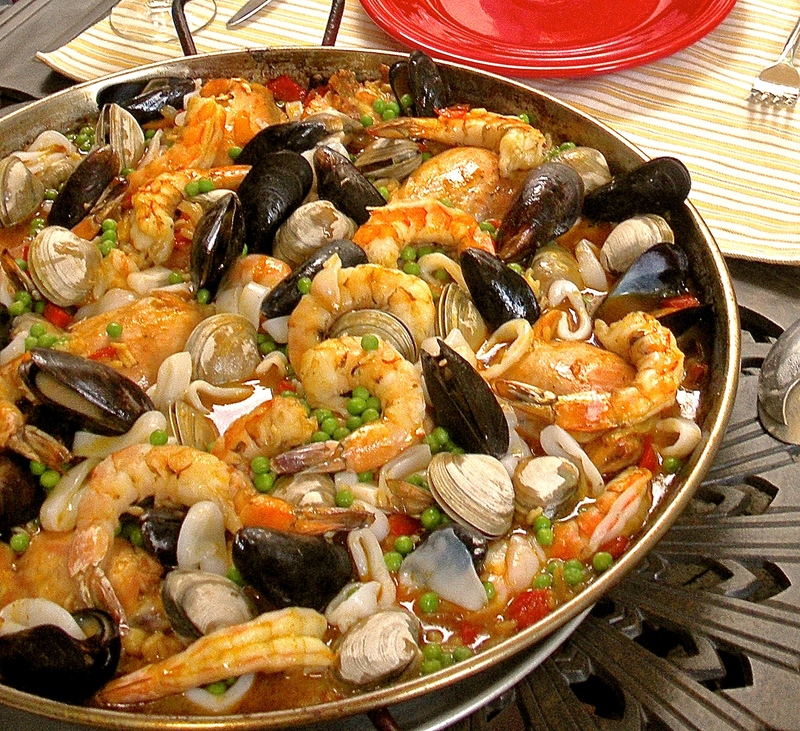 If you are looking for a centerpiece for a summer dinner party, consider a paella. The variety of ingredients – chicken, shellfish, vegetables, chorizo – will appeal to all taste buds and will surely wow your guests. Below is my recipe that will serve six to eight. The ideal pan to prepare paella is a paellera – a large, round pan with two handles. The pan is also very shallow to enable the rice to cook uniformly. If you do not have a paellera, you may use any pan that will cook the rice evenly, such as a roasting pan. I prefer to cook paella on the grill rather than the stove as the grill will accommodate the size of the paellera. The grill also retains the heat so that the rice forms a crunchy ring around the outer edge of the pan. Heat the grill to medium-high. When the grill is heated, place the paellera on the grill and pour the oil in the paellera. Once the oil is hot, place the chicken thighs in the paellera and season with salt and pepper. Brown the chicken on both sides. As you are cooking the paella, rotate the paellera periodically so that the ingredients cook uniformly. After the chicken is browned, add the chorizo and peppers and cook until the chorizo is lightly browned and the peppers soften. Stir in the rice so that the rice is coated with the oil. Pour in enough clam juice and chicken stock to cover the rice by about ¼ inch. You may need to adjust the amounts of juice and stock listed above. Stir in the sofrito. Turn the heat to high and let cook until the liquid is almost entirely absorbed by the rice and the rice is tender. Turn the heat down to medium and nestle the shellfish into the rice. First add the shrimp, then the clams/mussels. The shrimp are cooked when they are white and no longer translucent. This will take just a few minutes. The clams/mussels are cooked when their shells open. Discard any clams/mussels that do not open. While the shellfish are cooking, scatter the peas over the paella. The rice around the perimeter of the paellera should be browning and crisping during the cooking process. When everything is cooked, add the squid. The squid is added at the very end as it will only take about 2 minutes to cook. In order for squid to be tender, it must be cooked very quickly. When the squid turns white, test it to make sure that it is cooked. Remove the paellera from the grill and serve immediately at the table. Enjoy!